Santa is all ready for Christmas with his sack of toys. Children can countdown too with this colourful advent calendar - add a sweet or charm to the rings and build up the anticipation. The kit has large scale charts printed over two A3 sheets. 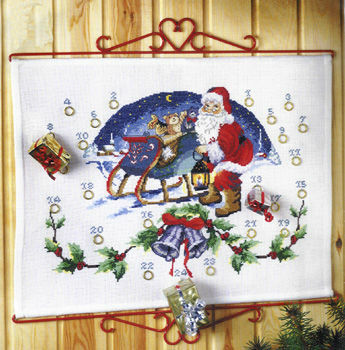 The pattern is worked in cross stitch and backstitch using 27 shades of stranded cotton. The stitch count is 210 by 150. The red metal hangers are not included but can be found in our Supplies and Accessories Section - the original has a pair 55 cms wide.